This post contains affiliate links. That means that, at no additional charge to you, I might be compensated if you make a purchase from any of the links below. All opinions - as always! - are my own. We opted for a rosemary bush instead of a tree this year (I hope I don’t kill it!) and some sprigs from a tree in our neighborhood. As Thanksgiving ended this year I realized that I wasn’t super jazzed about decorating the same way I had in years past. I use the same decorations year after year, house after house, and they just weren’t really sparking joy this year like they have in the past. Digging through the basement for boxes always feels like a lot of work to decorate, especially when we only end up enjoying them for a few weeks, tops. I was scrolling Instagram (as one does), when I came across some inspiration from my friends at The Preserve Shop. Rather than spending money on a Thanksgiving tablescape, they decorated exclusively with found and foraged items. I know what you’re probably envisioning: a table covered with dirt and garbage. But nope! It looked cute-AF and completely Pinterest worthy. I was obsessed. I also loved the idea of challenging myself to spend as little as possible on holiday decor this year while still going all out. My taste is always evolving. I realized that each year how I want to decorate for the holidays has changed. Rather than continuing to buy things that fit my yearly “vibe”, I’m challenging myself to make things or use things I can recycle after. I hate spending money on a tree. They’re expensive, and we honestly just aren’t home enough to enjoy having one. I would rather save that money to spend on gifts! If your heart is set on one, I’m not trying to keep you from getting a Christmas tree, promise. In fact, there are tons of reasons that buying a Christmas tree is actually good for the environment. I love how natural items look. A house filled with flowers will make me swoon any day. Our decorations take up SO much space. We still have tons of decorations that have been passed down to use by family members, and they take up almost an entire room in our house. We just don’t have room for more stuff. You probably don’t either! Making shifts in how to practice rituals (like a holiday) can be intimidating. I spent the last few weeks sniffing around the internet to find ideas that fit my personal style, were either inexpensive or free, and that didn’t look completely hacked together. Just because I’m challenging myself to celebrate the holidays a bit more sustainably this year doesn’t mean that I want it to look like my compost exploded all over my house, you know? Our decor is minimal, very Pacific Northwest-y, and a little bit industrial. I wanted to incorporate decor that would bring some holiday softness into our home, while trying to stay away from and explosion of primary colors and creepy 1970’s elves. Since I’ve spent so much time thinking about this, here are some ideas that were my favorite. Throw up some twinkle lights for instant holiday cheer. Twinkle lights make everything feel more magical without taking up too much space. I like to put lights along the perimeter of rooms, underneath shelving, or strung across the ceiling for a quick bit of extra cheer. String lights are great lighting for holiday parties. Hang some string lights, turn off your overheads, and voila! Instant mood lighting. Shop twinkle lights here, here, and here. Play around with pinecones for a winter-y vibe. Through my searches I kept coming across winter decor that included pinecones. I even saw a ton for sale at Target last week! My favorite is the pinecone garland on the top left, which could be made pretty quickly with some twine. For smaller pinecones, you can tuck them into a large Mason Jar or vase to make a simple centerpiece. Creating a faux-snow look (like the picture on the right) is done using a technique called flocking, which is relatively simple to DIY. Incorporate your garden into your decor. If you, unlike me, are good at keeping plants alive, I highly encourage you to use those cuties for your holiday decor! Especially if you live in the PNW, you probably have a LOT of greenery literally in your backyard that you can be utilizing. I saw fir boughs being sold for a stupid-high price at the market the other day, and half considered shutting down my blog and turning into a fir peddler. I digress. Instead of a Christmas tree this year we opted for a little rosemary bush that we will be planting once the holiday is over. We bought a mini light strand to wrap around it and have hung a few choice decorations, but that’s it. Honestly I much prefer the simplicity of our small yet mighty tree over a big tree that won’t be fully loved. I also loved the tablescape above from The Preserve Shop. Everything you see came out of a garden, but still looks totally festive. Get a little creative with the stuff you already have on hand. Use flowers and greens to decorate your home. Florals are timeless. Don’t @ me. Whenever my house is bursting with bouquets, I feel the deep sensation of having made it. 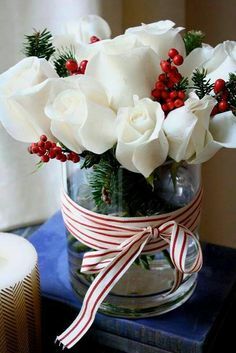 Flowers are a quick way to make any space feel festive. Especially if you are like me and tend to decide in the moment that you want to have people over. I like using flowers and greens to decorate for a few reasons. A little goes a long way, seasonal florals help to mimic the decor you’re going for, and (again!) it’s more sustainable than buying something you might toss out after. Instead, you can just compost it. You can also make this even more sustainable by shopping for flowers at a local market (WHATTUP PIKE PLACE) and meeting your flower grower in person. Buy wooden instead of plastic garlands for your tree. Wooden Garlands have popped up a ton this year- I’m into it. 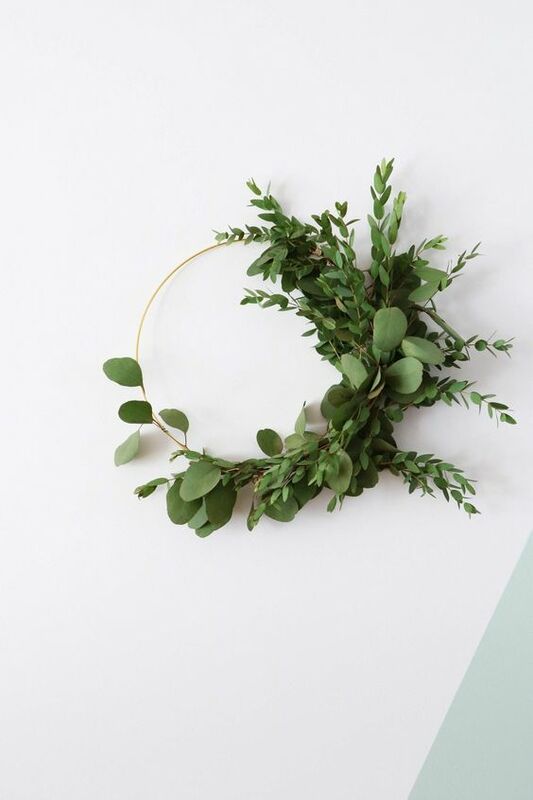 I like the neutral color palate (forever my favorite) for simplicity sake, but also for being able to use these to decorate for other things like birthdays, parties, and LIFE. Better for the earth than plastic and so much more attractive. Buy your wooden garlands here, here, here, and here. 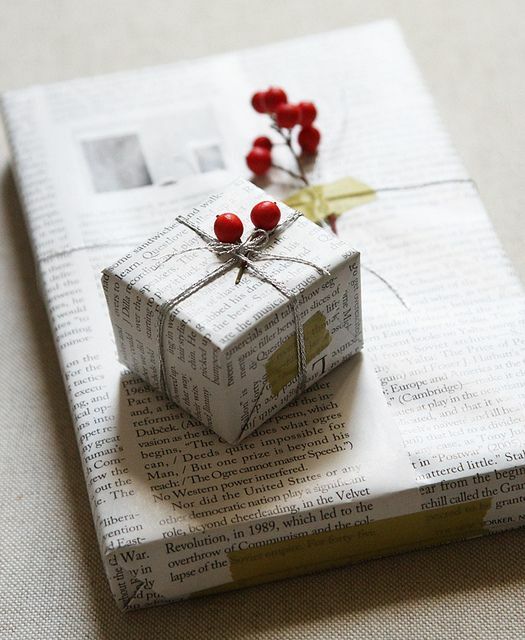 Use recycled paper instead of wrapping paper. 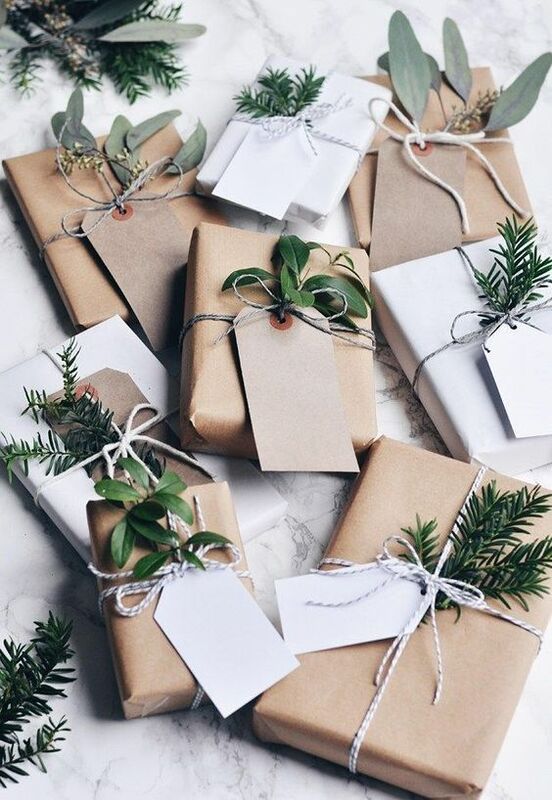 Wrapping paper isn’t always recyclable, ahh! I didn’t know that until… today. We have a roll of butcher paper that I swear gets bigger each year despite how much we use. It usually ends up being our wrapping paper out of sheer laziness, but I like seeing that it’s becoming Pinterest-worthy. I usually end up dressing out butcher paper up with stickers, glitter washi tape, or metallic pens. What are your thoughts on holiday decor? If you have any hacks, traditions, or ideas you think that I should know about, drop them in the comments below!